Treatment options for most patients diagnosed with a Glioblastoma Multiforme consist of surgery, radiotherapy and chemotherapy. Despite recent advances treatments remains palliative and not curative. The life expectancy for patients is still dismal, and in this context, the objective should be towards improving not only quantity but also quality of life. 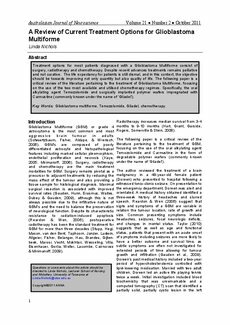 The following paper is a critical review of the literature pertaining to the treatment of Glioblastoma Multiforme, focusing on the use of the two most available and utilised chemotherapy regimes. Specifically, the oral alkylating agent Temozolomide and surgically implanted polymer wafers impregnated with Carmustine (commonly known under the name of ‘Gliadel’). Glioblastoma Multiforme treatment, Glioblastoma multiforme, Temozolomide, Gliadel, chemotherapy.